Water is a basic need of human life as an individual as well as a society. Riau Islands Province is an administrative area that is divided into several islands one of them is the Tanjungpinang city which is the provincial capital and also the city that has the most narrow land area compared to other regions. With these geographical conditions where the population continues to grow, it is necessary to manage the water resources well. This study uses a qualitative approach, this research wants to explain, describe and analyze the problem systematively with conceptual approach. In obtaining data with interviews with informants with cross-sectoral so obtained an objective picture of the object of study studied. 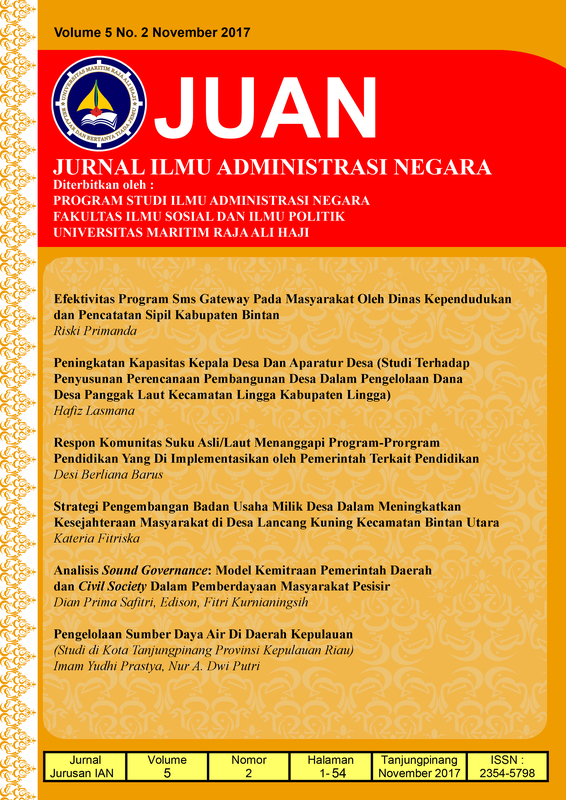 The results of the research indicate that the management of water resources in Tanjungpinang is not optimal yet. This can be seen from the destruction of protected forests due to the existence of oil palm plantations, forest encroachment which is then converted into plantations and settlements. The consequence is the decrease of water debit in the reservoir, where the reservoir is the only source of raw water as a source of water supply for the citizen. In addition, the unity of forest management has been the cause of the high level of forest destruction. On the other hand, the high level of water loss has also caused it to be distributed to the people of Tanjungpinang, where currently only 39% can enjoy clean water services from the PDAM (Municipal Waterworks).